Red Lion’s PAX panel meter is considered to be the workhorse of the company’s meter product line. 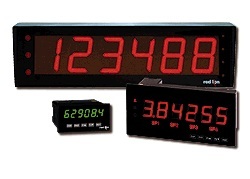 These panel meters have a variety of features to handle various application needs, including a sunlight readable display, field-installable options cards and more. PAX panel meters are designed with the widest range of inputs in the industry, and include both digital and analog signals. These meters feature a communications capability that allows the machine to collect data at various points and communicate that information to the management system. The machine operator has a localized display without sacrificing these convenient features.